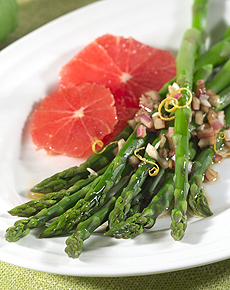 Bright and beautiful asparagus paired with zesty red grapefruit. Photo courtesy TexaSweet Citrus Marketing. This is Page 6 of a nine-page article. Click the black links below to view the other pages. In this recipe, asparagus is topped with a lightly sweetened grapefruit vinaigrette for a fresh, healthy dish with radiant color. Recipe yields 4 servings. For the vinaigrette, combine shallots with vinegars and let sit for at least 20 minutes. Zest one grapefruit (avoid the white pith). Add zest to shallots mix. Juice zested grapefruit to yield about 1/3 cup and add juice to shallots. Slowly mix in olive oil. Section remaining grapefruit. Just before serving, toss cooled asparagus with vinaigrette. Arrange spears and grapefruit sections on salad plates. Sprinkle with pepper. Serve immediately.